Nothing heralds the arrival of Christmas like the appearance of gingerbread houses. And although there are two forms of gingerbread (a soft form called Lebkuchen and a harder form), it is the stiffer dough that is associated with constructing gingerbread houses). This firmer German style gingerbread has long been linked the sweet-covered witch’s house in the fairy tale of Hansel and Gretel. The Brothers Grimm were the first to write down the story of the brave witch-battling brother and sister in 1812. But the story did not begin there. Folk historians believe the events that prompted the fairy tale sprang from the tragic days of the Great European Famine of 1315–1321 when massive famine caused desperate parents to abandon their young children in the hope the children could find food elsewhere. Sadly most died wandering lost in barren drought-striken landscapes. This tragic tale is so closely associated with gingerbread that the story’s evil child-eating witch is named “Frau Pfefferkuchenhau”. Her name actually means "gingerbread house" in German. Later these houses, covered with a stunning array of colorful candies and decorative icings were built in surely happier times to reassure both parents and children that such dark days would never return again. Today children around the world delight in making and visiting gingerbread house collections. In the United States one of the most elegant is at the White House. Indeed it is a model of the White House itself, complete with a healthy kitchen garden and a model of the Obamas’ beloved pet dog, Bo. In London it is the grand Dorchester Hotel that elicits cries of delight. And why not - their gingerbread 'house' captures the essence of their grand structure. Afternoon tea anyone? Say yes - say yes! But it is in Bergen, Norway that you will find an entire city made of gingerbread houses. Each year the city sponsors Pepperkakebyen, the Norwegian name meaning "Gingerbread City". It is the world's largest such assemble of gingerbread houses with each child in the town (under the age of 12 please) entitled to make their own house for what must be one of the world’s sweetest Christmas cities’. So take heart - it’s not too late to found your very own town. 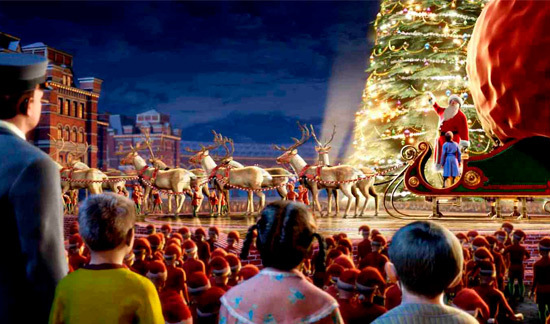 After all, Santa Claus has had his very own town for centuries! What would you name your's? Post Note, November 30, 2012: If you're wondering what the rest of the White House decorations look like, take a fun walk-though with Bo, the First Family's beloved pet dog. Posted on November 29, 2012 by Ana Kinkaid and filed under Architecture, Bread, Chefs, Christmas, Cooking, Creativity, Cuisine, Culinary History, Dessert, Elegance, Films, Food, Great Britain, Holidays, Hotels, Movies, Sustainablity, White House and tagged Bo Candy Dorchester Hotel Gingerbread Houses Great Famine of 1315-1321 Hansel and Gretel Icing Lebkuchen London The Brothers Grimms The Polar Express Witches.